It goes without saying that the best way to deal with frozen pipes is to prevent them from freezing in the first place. However, many people in Canada will eventually have to deal with frozen pipes in the winter. If it happens to you then you will need to act quickly in order to reduce the amount of damage as well as the costs involved to repair the damaged pipes. A plumber in Toronto can take care of your frozen pipes for you, but below are some tips that can help if you decide to tackle the issue yourself. 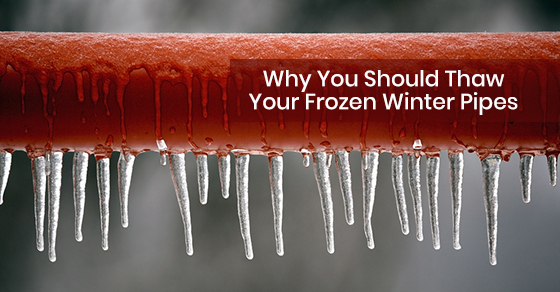 It should be noted that not all frozen pipes will actually burst, but many do with time. When a pipe does burst it does so because water actually expands when it is frozen. As the plumbing pipes are unyielding, the immense pressure eventually leads to them bursting. A small leak at a crack or joint on the length of the pipe can lead to a massive cascade of water that will flood your kitchen or bathroom. One of the main reasons why you should thaw your frozen winter pipes is because burst pipes are one of the most common homeowners insurance claims. In fact, the average claim cost is over five thousand dollars. If you notice that your water line is bulging like a well-fed anaconda then your pipes may be frozen. Your water line may also be coated with frost in some cases. However, not all plumbing pipes can be seen. You may also notice that your toilet does not fill up as it should after you have flushed it. Or, your faucets may not flow as designed. If you are dealing with either of the aforementioned issues then there is a very good chance that your pipes have frozen over. Before you get down to business you will need to either cut off the water supply to the entire domicile or the particular section of plumbing. In reality, the real trouble will arise after the pipe has actually been thawed, so you need to play it safe and shut off the water supply before you attempt to actually thaw the frozen pipes. That is, the frozen water may actually be acting as a sort of plug that is preventing the water from gushing out of the cracks in the pipes. Once the plug has been thawed the water will flood your room. As such, be prepared and bring a bucket, a mop, and some paper towels in case of a serious plumbing leak. In regards to what you should use to thaw your pipes, we would recommend a hair dryer, heat lamp, or a space heater to take care of the length of pipe that has frozen over. Thermostatically controlled heat tape should also be wrapped around your frozen pipe. Depending on the length the cost of the heat tape will range from fifty to two hundred dollars. Thermostatically controlled heat tape is great for thawing trouble spots in a quick and efficient manner. Also, do not, under any circumstances, use a propane torch to try to thaw your frozen winter pipes. Using a propane torch will significantly increase the risk of a fire breaking out. Of course, in many cases, you may be too late, and your pipes may have burst before you even realized they were frozen to begin with. Hence, if you notice that your basement is filled with water then you will need to shut off your main water supply as soon as you can: This will help reduce the amount of flooding in your basement. The next thing you need to do is call a fully licensed and bonded Toronto plumber. While you wait for the plumber from Toronto to arrive you can help them out by using a mop to soak up as much water as you can. If you don’t have a mop handy then you can use a dry/wet vacuum, some sponges, or some paper towels. You should also run a humidifier if you have one to dry the space thoroughly. By doing so, you will be able to deal with any moisture-related problems, such as mildew and mold formation. In some cases you will also need to call your insurance agent, as the damage incurred may be substantial. The good news is most homeowners insurance will actually cover water damage caused by burst pipes as well as burst pipes themselves. Shutting off the water as soon as possible will minimize the amount of damage incurred down the road. However, in order to shut off the primary water shut-off valve quickly, you will need to know where it is actually located. Hence, take the time to locate the valve as soon as you move in, and ask a Toronto plumber to inspect it the next time they pay a visit to your home. Some older homes may use a gate-styled valve that is actually outdated. If your valve is antiquated then it may be worth the investment to replace it with a reliable ball valve. A typical ball valve will cost between two hundred and four hundred dollars but it can save you a lot of headaches down the road. However, if you decide to stick with your gate valves then you should rotate them back and forth at least once a year, as they can be prone to sticking when you really need them. If you need a plumber in Toronto to thaw your frozen winter pipes or deal with pipe related water damage then please call Brothers Plumbing at 1-800-741-8471, or contact us here.